Sometimes a bracelet bender isn't enough. These pliers will form synclastic shapes like bracelets, hoop earrings and any other form that requires a concave surface. They are very easy to use. They come in three sizes 3/8", 1/2" and 3/4". The 3/8" will form a deep synclastic form with tight radiuses. 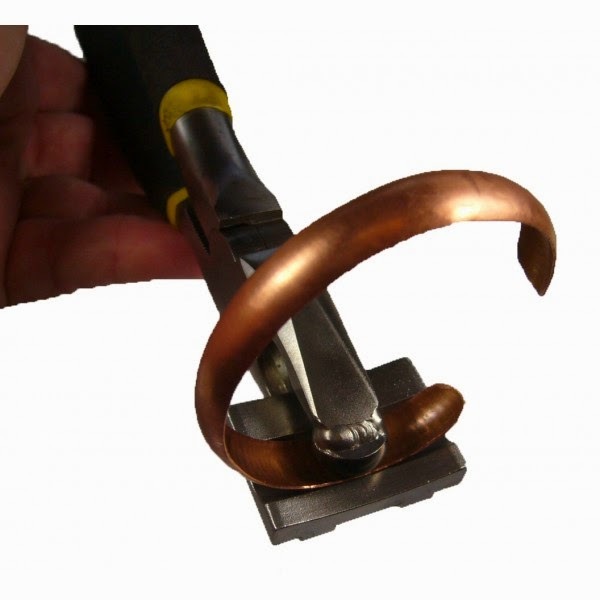 Can be used with copper, silver, gold, brass, even stainless is possible. Aluminum works fine as well. Metal can be annealed or not. Wrap a thin piece of leather over your cuff to prevent any scratches. And you will get beautiful curves.